Perfect Enterprise Application Diagramming software with rich examples and template. Edraw is ideal for software designers and software developers who need to draw Enterprise Application Diagrams. Use the Enterprise Application templates to design and document enterprise-wide system diagrams that include physical and logical components. Show software architecture or communication flow among assets enterprise-wide. 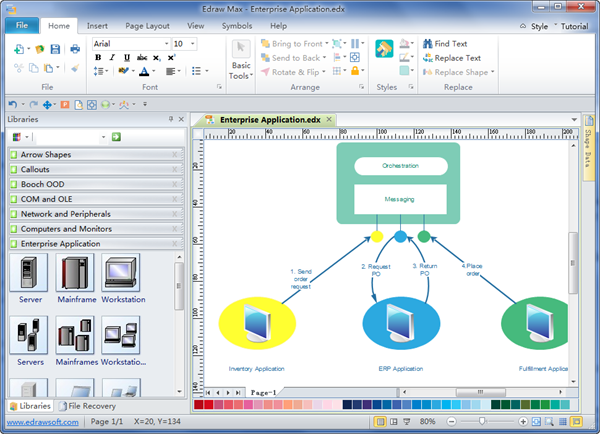 In Edraw Professional, the Enterprise ApplicationDiagrams templates and shapes are in the Software folder. Software architects: Represent hardware and software architecture layers. Network administrators: Show network communication between users and computing resources. Data center managers: Model the boundaries and processes of users in an enterprise. On the File menu, point to Library Gallery, point to Software, and then click Enterprise Application. Drag shapes that represent your physical, enterprise-wide system components onto the drawing page from Enterprise Application. Drag shapes that represent your logical system components, such as boundaries, data stores, and processes onto the drawing page from Enterprise Application. To add text to a shape, select the shape, and then type.